9/92 David Mumpower A shocking yet subtle attack on a currently trendy political philosophy. 47/55 Reagen Sulewski This probably would have made one of the best Outer Limits episodes ever but as a movie it doesn't hold together. The buzz on Bryce Howard is legit. 64/126 Kim Hollis Bryce Dallas Howard is remarkable, but the film is probably Shyamalan's weakest effort to date. M. Night Shyamalan's movies tend to inspire loud rantings from serious movie fans in general, and BOP staffers in particular. There are some misguided people who feel that Shyamalan is an overrated Hitchcock wannabe who is too reliant on gratuitous tricky camera angles and gimmicky plot twists. Other less insane people enjoy his visual style and storytelling and appreciate his ability to get great performances out of his actors. In any event, The Woods is Disney and Night's third feature film since the phenomenally successful thriller The Sixth Sense spawned a legion of dreadful "I see dead people" jokes. Home town booster Shyamalan has once again filmed in the area around Philadelphia. This project was originally set to star Kirsten Dunst, favorite of horny nerd boys everywhere, and Ashton Kutcher, favorite of pea-brained teen stoners and a very small segment of really hot over-40 female action stars everywhere. However, Dunst dropped out early on, reportedly because she wanted to start in Cameron Crowe's romantic comedy Elizabethtown. Since the ubiquitous Kutcher is now also slated to star in Elizabethtown [editor's note: Not anymore, as now Kutcher is out of both projects--BWAHAHAHAHA! 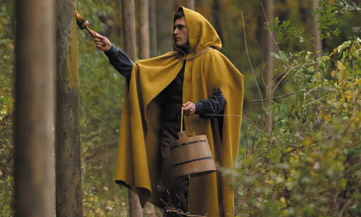 ]), we assume that he is out of The Woods, too. Although given all the other projects he's currently attached to, maybe he's planning to use the Continuum Transfunctioner to bend the laws of time and space. August 27, 2003 Judy Greer has been added to the cast as Bryce Howard's older sister. Greer is probably best known as the skinny blonde coffee shop waitress that Nicholas Cage fantasizes about in Adaptation (or, if you are a connaisseur of schlocky teen movies, you'd recognize her as Fern from the Rose McGowan murdering teen vehicle, Jawbreaker). The title has now been changed to The Village. No word as to who is scheduled to play the cop, the Indian chief or the construction worker.